It’s almost that time of year… when family and friends gather, prepare delicious food, and sit down together to give thanks for all their blessings. I am the first to admit that serving dishes and colorful plates are not the most important part of this holiday. However, I do believe that food tastes better when it is displayed well and that hand-crafted pottery is the perfect pairing for hand-crafted recipes. With that in mind, I’ve put together a guide to setting a beautiful Thanksgiving table. #1 Size: Be sure the food fits the dish. The first consideration in how to set a beautiful Thanksgiving table is the size and shape of your plates and bowls. You want to choose ceramic serving dishes that fit your food comfortably, with plenty of space for hands to pass the dish or serving spoons to rest within it. #2 Color: Show off your food. I love adding grapes and dried fruit to a cheese plate, both for the visual effect (adding color) and to balance the richness of cheese. The Tuscan Fruit Platter (below) is perfect because of its hand-painted fruit motif, which supplements whatever you serve on it by adding a backdrop of fresh fruit color. Colorful foods are always the easiest to make look good. The most important thing to keep in mind with especially bright and colorful food is to serve it on a plate or in a bowl that allows its color to really stand out. If the serving dish is too colorful itself (whether in a different or similar color), the food will not stand out. For bright orange yams, I opt for a white background so the color can really pop. Here are too great options: Gorky Gonzales’ El Mar Platter (seen on the right) and Ceramica Valenciana’s Rectangular Platter in white (below). The El Mar Platter has always been one of my favorite ceramic serving dishes because of the unique shape and subtle decoration around the edge. In this case, the complimentary colors of deep blue in the glaze and golden orange of the yams play off each other perfectly. Yum! #3 Style: Whether sophisticated or casual, pick a style and stick to it. You can pretty much tell by the collection of pieces I’ve curated at Emilia Ceramics that I usually opt for a relaxed, laid-back style. But there are definitely events (Thanksgiving being one of them) when a more sophisticated style is in order. That’s why I love Gialletti Giulio’s plates. They have a grown-up, fancy look to them, but still maintain their hand-painted authenticity. You can literally see the brush strokes that were applied by the Italian artists who made them. But they also offer a lovely white backdrop for your meal. And there’s a variety of designs, which look great mixed and matched together or used separately. My favorite style for dessert plates is subtle, yet fun and festive. The Spanish dessert plates (below) by Ceramica Valenciana are my ideal, because they work regardless of whether you’re serving pie, cake, brownies, or fruit salad. They are delicate, charming, original, and stylish. These plates are perfect for serving all ages and really showing off whatever dessert you’ve prepared. Other great dessert plate options are Richard Esteban’s fun yellow plates with various center designs, from cars, dogs, fish, and birds, to more festive polka-dots and stripes, these plates are as sweet as any dessert imaginable. For a more refined, grown-up look, Gialletti Giulio’s more basic plates with stripes are a lovely backdrop for apple or pumpkin pie. Do you have any special tips for how to set a beautiful Thanksgiving table? We’d love to hear them, so please share in the comments section below. While the month of May brings many things – warmer weather, the end of the school year, Memorial Day getaways, and summer vacation planning – the most important is probably the celebration of mothers. But what’s the best way to communicate our appreciation and gratitude to those special women who gifted us life? While many kids and husbands tend to defer to the typical stand-by’s of flowers, brunch or jewelry, we recommend taking a moment to consider what would best support her and her unique lifestyle. For the special mom in your life who would prefer to spend her free time outside, your gift opportunities are plentiful. Maybe she’s longing for a weekend retreat to the great outdoors, in which case, you could make the trip possible or buy some supplies for the experience. Need some ideas? REI suggests a list of ways to incorporate nature into the celebration. If backyard patio time is more her style, you might find the right gift item amongst our Garden and Patio pieces. You could consider making a date to take your mom to the nursery and then surprise her with a planter, (the Round Paloma Planter is a personal favorite). Or if gardening isn’t her thing, try this one-of-a-kind Gorky Gonzalez Hurricane Candleholder – she can enjoy it on the patio all summer long. If the mom you have in mind spends her days rushing to and fro, the gift of relaxation is always appreciated. Gifting a massage or pedicure encourages her to take a moment for herself, when she can leave her worries behind. Another way to pamper the hard-working mom in your life is to cook her dinner, clean her car, or anything else that would make her day easier and more enjoyable. If you’re looking for a tangible gift for the mom with too much to tend to, consider common-sense items, such as the Deruta Oil & Vinegar set, a set of Blue Stripe Mixing Bowls, or a Large Pomegranate Pitcher. If it’s just too hard to predict what she will find useful, an Emilia Ceramics gift card is a no-fail option. Then she can decide which beautiful piece she needs and wants most. Separate from these collections, a few of my favorite entertaining items include the La Fiesta Round Serving Dish or a set of the Little Square Plates in Blue. Whether the special woman you’re celebrating this May fits into one of these categories or not, we expect you’ll find any number of relevant options here. We’ll leave you with just one reminder – spend a little time to find something that suits her unique personality and she’ll know just how much you care. Near the start of every new calendar year, Pantone – an authority on color – declares a symbolic ‘Pantone Color of the Year.’ According to Pantone, the color of the year serves as a “snapshot of what [we] see taking place in our global culture that serves as an expression of a mood and an attitude.” A few examples of recent colors of the year include, Cerulean Blue, Mimosa, and Honeysuckle. In December, Pantone announced the 2017 Color as Greenery, (or for those with design prowess: P 15-0343). Representative of life and new beginnings, Pantone Color Institute Executive Director, Leatrice Eiseman, speaks about Greenery as denoting the reconnection we seek with nature, each other and our larger purpose. Whether or not you resonate with the symbolism, you can definitely appreciate the hue. In this post, we help you think through designing with the Pantone color of the year. Below, we’ll explore the color psychology of Pantone’s Greenery, and offer suggestions about how to integrate it into your home. Color psychology is the study of how hues relate to human behavior and the inconspicuous ways they influence perceptions. If you pay attention to your subtle response when you enter a room, you might notice feelings of comfort, excitement, security or any number of other reactions. Believe it or not, the dominant color surrounding you in any space has an effect on your mood or spirit. Psychologically speaking, the color green is synonymous with liveliness, growth and renewal; not dissimilar to what the color physically represents when it shows up in nature. It is believed that green offers a sense of health, prosperity, tranquility, and even fertility. Being in a predominantly green space could even relieve stress and prompt healing. Think about the spaces in your home, and consider the rooms that might benefit you, your family, or your guests by your prompting these types of reactions. In addition to offering us the official color of the year, Pantone also presents pairings that work well with Greenery. Before you get to designing for this Pantone color of the year, you can reference these recommended hues to determine what room might offer the most opportune palette for incorporating the color green. As spring approaches, I’m beginning to take a fresh look at how I can reinvigorate my interior. A color like Greenery, especially at this time of year, can inspire so many ways to integrate green, (and as a result, the feelings of health, prosperity, and tranquility) into the home. The most significant change for you might be a wall color change. Though if you’re not in the mood to make this type of commitment, consider an accent wall or accent décor. For those with a green thumb, visit a nursery and invest in some living accents for any room in your home. This year I’m looking forward to less spring cleaning and a lot more spring green-ing! The holiday of love is almost upon us and you might be expecting the usual flowers, chocolates or jewelry again this year. Or, perhaps you and your significant other decided to forego material gifts this year in favor of quality time with one another. If that isn’t the case, and you’re hoping to receive something unique this Valentine’s Day, consider finding a way to slip a link to this post to your loved one. Here at Emilia Ceramics, we’d like to see your love celebrated with the gift of a ceramic treasure from one of our talented artists. Below, we showcase a few such ideas, characterized by a specific passion your partner might recognize in you. The wine loving woman in your life appreciates nice things and just another bottle of good wine isn’t special enough for this occasion. Luckily, we have many gift options for the vino-inclined. A classic is this Black Striped Wine Bottle Holder by Talavera Vazquez. If she’s drawn to old-world design, she might appreciate the Antique Vino Pitcher… Or for a more irreverent oenophile, these Vino Cups by Ceramica Valenciana are pure fun. If she has everything a wine drinker already needs and then some, a fun add on to a quality bottle of her favorite wine would be any of our wine stoppers, like this Fiore Wine Cork by Ceramiche D’Arte Tuscia in Montelupo Florentino, Italy. For more ideas, check out all our Wine Accessories or our special gift-giving section for Wine Enthusiasts. Spoon Rest, by Ceramiche D’Arte Tuscia; the Burnt Honey Etched Trivet by artist, Richard Esteban from Aigues-Vives, France; and this timeless White Footed Serving Dish by Ceramica Valenciana. If your partner has a certain affinity for the “sweeter” things in life, give her a gift that will help her bake or serve her favorite dessert. Small appetizer dishes are perfect for dishing up chocolate truffles or petit fours. Especially for a more delicate or intricate dessert, small plates that offer a blank canvas are best, such as the Gogo Square Plates in five fun colors. For a light-hearted dessert lover, the Wildflower Bouquet Cookie Plate is a great idea, as are any of the small pieces created by French artist, Sylvie Duriez. As a compliment to any of these, think about coffee drinking accouterment, such as this San Miguel Mini Creamer and the San Miguel Sugar Bowl. For more dessert-friendly gift ideas, check out our Footed Platters and Bowls, (great for displaying cakes, cookies, brownies, and cupcakes) or our collection of Appetizer and Mini Plates. Beyond just gift ideas, my advice is to always think outside the box when shopping for that special someone. Try to picture yourself, as them, doing something they love to spend time doing and get creative from that perspective. And remember, provided your gift is picked out with the intent of wanting to make your loved one happy, you really can’t go wrong! If you know anything about Emilia Ceramics, you know we love to travel. Each one of our artists is selected because of their unique contribution to the timeless craft of pottery. From Italy to Mexico, including a number of countries in between, we have a passion for bringing custom-made, one of a kind ceramics from remote communities across the globe, into your home. In my continuous search for pieces I think people will cherish, I find myself learning a lot about other cultures. Before I set off for a new location, I do a lot of planning. Researching international destinations and then experiencing these amazing towns and cities in person, has enabled me to learn a lot about local customs, the people who live in different parts of the world, and the values that influence their lives (and their artwork). While I go on buying trips at all different times of the year, many people travel internationally around the holidays. If that’s the case for you and you’ve recently returned home from an awe-inspiring holiday trip, this post is for you. Here’s my advice on how to hold on to some of that old world culture you discovered, when you’re back at home. No matter what corner of the world you visit, chances are, you’ll be exposed to a beautiful new language. I find the local language of any country I visit to be such an important part of the total experience, (regardless of whether or not I can understand everything my new friends share with me.) So much so that in addition to the few key words and phrases I learn before my trip, I’m sometimes motivated to continue my learning when I arrive home. Duolingo is a great app to use in practicing a little before you go, or once you come back. One of the simplest ways I’ve found to quickly return to the memory of a country I’ve loved is to spend a few minutes speaking the native language. Due to restrictions on the flight home, bringing your favorite local cuisine home with you could pose some challenges. Although there are ways you can pack and ship, or stow, bottled beverages and packaged foods that you just can’t depart without, it is probably more feasible to try to recreate the recipes at home. Here’s a sampling of some shortcuts to making international delights in your own kitchen. Of course there are any number of great cookbooks out there that focus on International cuisine, many of which come with inspiring photos and stories about the local chefs that created the recipes. This is a great excuse to host a dinner party and share the memories of your trip with friends or family. This is a recommendation I have for everyone who takes a trip beyond the U.S. borders. Procuring a piece of art from a foreign country doesn’t have to be expensive – you can spend any amount that matches your budget. While gallery visits are wonderful, the artwork found there is typically among the pricier of options. Though in many countries I’ve visited, I’ve been to outdoor markets that feature local artists selling paintings, photographs or hand-made goods. Here’s just one list from Frommer’s. I’ve even framed some of the city maps that you get free when you check into a hotel. The really special ones are those that I’ve worn out while exploring the city and that have pen marks where locals have recommended restaurants, markets, or museums to visit. Of course, the photos you take are often the best mementos from a trip. Blowing up a few of your favorites and framing them is a great way to cherish the memories of a great adventure. Obviously, I’ve always loved to collect local ceramic artistry, originally for myself and now because I love to share it with my customers! But in any country you visit, you can find artwork that comes in a format that matches your style. Where are you going next? Perusing the Emilia Ceramics collection might inspire your next destination of choice. This time of year, with everything going on, it’s common to know people who are scrambling trying to prepare the final touches for hosting the holiday party. If you’re one of these people, don’t fret. With this short list of priorities, you can enjoy a relaxed, yet festive party that leaves your guests wondering if you hired a professional event planner! First things first – start by prioritizing your guests’ experience. At an event of any size, your friends and family want to have an enjoyable night. This comes less from fanfare and more from the space you create to allow connections to develop or strengthen. Don’t try to do it all. Apart from the food and drink, adding one or two other feature elements can give your gathering that special touch. Consider combining two or three essential oils, like any of these options from the Keeper of the Home blog, and use diffusers to add a subtle signature scent to your space. To complement this, make the room twinkle by scattering LED string lights or unscented candles on a few out of the way surfaces. At your party this year, think about how to celebrate Mother Nature’s contribution to our seasonal merriment. Looking to the table setting you plan to feature, determine what outdoor elements could add to your décor. I’m fortunate enough to be surrounded by the organic gifts of the Rocky Mountains, which means I have a handful of options. From pinecones to sprigs of Evergreen to branches with berries, I like to intersperse natural elements everywhere I can. If this isn’t accessible in your area, you can still bring the outdoors in by incorporating wood grain serving trays or utensils. Or, consider crafting a bit before the party begins with a few ideas from Brit+Co. Even a small collection of spirits, mixers and cocktail accouterment, displayed with gold or silver-rimmed glassware on a modestly decorated bar cart can bring a festive flair to your event. Curate a couple of mixologist-inspired drink recipes – like any of these – and set out copies. Or encourage your guests to try their hand at getting creative in crafting the blend that suits their palette. If you want to go all out, you can still follow the above tips to get started. Then, follow some advice I received a few years ago for putting on a hit event: Walk yourself through the party, from beginning to end and make a list of the details you want to ensure get included. Turn the holiday party into something more elaborate by bringing in some outside entertainment, adding custom floral arrangements to every surface, or make a personalized gift for guests to take home. Just in case you’re looking for some last-minute wares to get you ready for the event you’re hosting this year or next, here is a collection of holiday serving dishes I’ve put together. Regardless of your party planning style, remember it’s your guests’ experience that makes memories. And hosting the holiday party should be about celebrating the time spent with those who matter most to you. Tis the season! If you’re anything like me, you’ve just started making your gift list for friends and family. In case you’re struggling with what to give a few of those special people in your life, or if you missed (or chose to skip) Black Friday, don’t worry. I’ve got you covered with this year’s holiday gift guide, inspired by personality types. I like to be thoughtful with what I pick out for my loved ones but sometimes I’m just not sure where to start. What I’ve found to be helpful is to think about the personality of the individual and how that has come to define their passions. Whether you’re searching for your aunt, the frequent international traveler, your mother-in-law who collects unique artwork, or your designer friend who has a one-of-a-kind everything, you can find that special something at Emilia Ceramics. And the bonus is that everything sold by Emilia Ceramics is unique so there’s no chance of giving the same gift as someone else. Your gifts will be meaningful and memorable…they’re sure to become cherished heirlooms. We can all dream of being like those friends or family members who take exotic trips every year (or multiple times a year). While you might not be so lucky, you can celebrate their love for trip-taking this holiday by surprising them with a handmade, one-of-a-kind piece from a country they haven’t yet visited. Quick Tip: Shop by country to find sets of items made by our talented artists from Spain, France, Italy or Mexico. It’s likely the art-lover in your life seeks exclusivity, as well as beauty in all things. You’ve probably noticed this is especially the case with the framed and display pieces in their home. For this personality type, choose ceramics with intriguing patterns or designs that fit with his or her décor style. Consider whether they’re style is more contemporary (stick to black and white or grey pieces) or more whimsical and colorful (go crazy with bold statement pieces). Quick Tip: To see all our most artistic and unique items, look at everything that’s one-of-a-kind. A few of our artists never create the same design twice, so for the true collector, these are amazing collections to peruse: Sylvie Duriez (France) and Capelo (Mexico). That super creative friend of yours has a very specific style. You may have even tried to nail the style a time or two in the past and found you’d misjudged. Unless you know exactly what he or she is looking to add to their space, or you have a common style and experienced design eye, I’d suggest you aim for simplicity when shopping for friends who pride themselves on sourcing their own artwork. Consider pieces that tend to work harmoniously with more intricate décor. Quick Tip: Most of the pieces in the Ceramic Valenciana (Spain) and Talavera Vazquez (Mexico) collections could make great additions to a designer’s home. Additionally, a lot of artistic types I know love the Richard Esteban collection for its rich colors and unique finishes. While it’s likely that this holiday gift guide doesn’t cover the full list of personalities that show up in your friend and family circle, it’s hopefully a helpful start. Regardless of the preference or style of the person you’re shopping for, the Emilia Ceramics collection has exclusive gift ideas at any price point. In Part 2 of my look at fresh fall design trends this year, I reviewed options for how to add metallic accents and mix metals and woods when designing in the home. And since winter has yet to hit Colorado, there’s still time to experiment with the third and final trend among this year’s seasonal décor styles. From leading with neutrals to mixing materials and patterns, this is probably my favorite among the three trends I’ve explored this season. In my last post, I took a look at one of my favorite trends from this year’s fall designs. If you missed it, read what I shared about letting neutrals lead in Part 1 of This Year’s Fresh Fall Designs. To continue the discussion of this year’s hottest design styles, here is another trend I’ve become inspired by and am currently loving. It’s official – the weather is starting to change and I’m beginning to feel the transition to autumn. Every year around this time, I’m sad to have to say goodbye to the past few months of outdoor activities. The good news is I get to cozy up inside my home. As I do, I look for inspiration in the newest trends in décor. I just received my order…..everything is just lovely…..and all in perfect condition due to your great packing. My nephew and niece to be loved the vase and the water pitcher. I love giving presents from your shop because they are so unique. Everyone appreciates that they have received something very special! Catching up on some sales research this week, I found that colorful Gorky Gonzalez pottery is currently one of my best sellers. I’m not surprised. Gorky Gonzalez is the most well known of any of the artists I work with and his popularity extends across both Mexico and the U.S. Because other stores sell his colorful pottery, I strive to curate a unique collection of Gorky pottery for Emilia Ceramics. Nearly all the pieces I sell have been hand-picked during a visit to Gorky’s studio in Guanajuato, Mexico. When I do order from afar I am very specific with Gorky and his team about the designs and patterns I want. As a result, I am never disappointed with the colorful Gorky Gonzalez pottery I receive. Gorky pottery comes in two styles. Some people like to mix and match them, while others are more drawn to one or the other. The more traditional style is first dipped in a creamy, off-white glaze. Once that has dried, artists paint various decorations around the edges of plates and bowls, and sometimes add a center design. Many of the figures painted on these pieces have been influenced by historic Majolica tradition, like the rooster, which is very similar to what you see on Italian ceramics. Mexican influences can also be seen, both in the vibrant colors and in motifs like the Catrina figure. I love this melding of ceramic traditions and international influences; It’s a very unique element of Gorky Gonzalez pottery. Some of the traditional Gorky pottery is quite elaborate, while other pieces are subdued and offer a rustic simplicity. Many people like to mix and match their patterns so they can alternate daily between a plate with a fun fish motif and one with a carefree cowboy. Others like to set a stylish table with dinner, salad, and dessert plates that all match. Regardless, if you’re a fan of Gorky pottery, you’re most likely also a relaxed, creative person, who enjoys living an artistic and joyous lifestyle. I’ve never met a Gorky lover that I didn’t like! Named after Gorky Gonzalez Jr. (who goes by the nickname Gogo), the more contemporary Gogo pottery is just as popular among my customers. While there are a lot of other plates, bowls, and mugs out there that are painted in solid colors, Gogo pottery is in a class of it’s own. These pieces have a soft, touchable element to them that is completely unique to Gorky Gonzalez pottery. Their originality starts with the clay, which is made from local soil in the nearby Sierra de Santa Rosa. This clay (which has been used for centuries by Indian ceramists in the area) lends Gogo pottery it’s soft, porous feel. Next, artists hand-dip or paint the pieces in mineral-based glazes. The glazes really set Gogo pottery apart: soft, butter yellow, rich terracotta, fresh cucumber green, and deep navy blue. The chalk white has more dimension than you’d imagine and the cherry red is vibrant and festive. The entire process results in cheerful mugs perfect for your morning coffee, eclectic bowls to show off a homemade soup, and relaxed dinner plates worthy of a great family meal. Do you prefer the traditional Gorky pottery or the contemporary Gogo pottery? Leave a comment below to tell us your favorites and how you use and enjoy your pieces. July is a month filled with French inspiration. In addition to celebrating Bastille Day and watching the Tour de France, this month’s hot days and warm nights seem to scream out for a bottle of Rose and light French dinners enjoyed outside. The handmade and hand-painted pottery that I’ve collected from Provence fits right into this environment. Whether you prefer the rustic earthiness of Richard Esteban’s plates, the originality and playfulness of Sylvie Duriez’s bowls, or the simple sophistication of Ravel’s pitchers, these French Country favorites celebrate the laid-back mood of summertime. Here’s a roundup of my summertime French Country favorites… enjoy! It’s May, which means wedding season is officially underway! I love weddings, especially those that really exude the personality of the couple getting married. When I choose a wedding gift, I try to mirror that individuality by picking a gift that is uniquely fitting for the bride and groom. The best wedding gifts reflect the couple’s originality and show that you were thinking specifically of them when you picked it out. Of course, some couples you know better than others. It’s easy to pick out a thoughtful and unique gift for your best friend… a little more difficult to be really creative with a coworker or second cousin who you barely know. Here’s my guide to the best wedding gifts, based on things like age, life-stage, and general interests. These are the types of statement pieces that work with any style and become instant family heirlooms. Because everyone can use a cool salad bowl (and they double as fruit bowls between salads). Right: Large Mixing Bowl with Blue Stripes by Gorky Gonzalez. These classic Italian serving platters elevate any meal and can also be hung on the wall for decoration. These pieces have tons of unique personality that will compliment any party. A colorful, tall vase has a small foot print, but makes a big impact. For the minimalist couple, these hand-crafted pieces add subtle character to a modern landscape. If you don’t know where to start, I suggest looking at a couples’ registry online. Even if you don’t want to buy what’s listed, it will give you an idea of their style preferences and what they need. Have questions about buying the best wedding gifts? Call or email us… we’d love to discuss some options with you. I cannot believe this Sunday is Easter! Wasn’t it just New Years like last week?! Yikes, time is flying in 2016 and it’s time to set a beautiful Easter table. Here are my favorite pieces for sharing a big meal, whether in celebration of Easter, Passover, or the spring season itself. Setting a beautiful Easter table also requires interesting, festive centerpieces like lush flowers arranged in original vases and pitchers. Tulips are a popular Easter flower and they look fantastic in the two vases below, left: Blue Striped Mexican Vase by Talavera Vazquez; And right: Butter Yellow French Pitcher by Richard Esteban. Here are some other beautiful vases and pitcher vases. Do you have any other tips for spring entertaining? Share them in the comment section below! Do you use colorful plates or more basic, all-white ones? Nobody does colorful plates as well as Gorky Gonzalez. Whether you’re a fan of his traditional line featuring palm trees, birds, cactus, donkeys, and cowboys… or his more contemporary Gogo pieces that are glazed in solid colors, these plates will charm you and your guests. I love stacking the dinner, salad, and dessert plates with a variety of outside patterns. The effect is eclectic and fun, very colorful, and adds so much personality to the table. Another great way to use Gorky Gonzalez pottery is by mixing decorative plates with the Gogo pieces. Not only are these plates super colorful, but they also have a rustic authenticity that can only come from handmade, hand-painted ceramics. And while Gorky pottery is available at other stores, Emilia Ceramics in Boulder, CO (and online) has one of the best collections of colorful plates made by Gorky Gonzalez. Also sold by Emilia Ceramics in Boulder, Colorado, the Spanish dishes by Ceramica Valenciana combine charm, simplicity, and an antique quality that is completely original. In fact, I would call the plates by Ceramica Valenciana our most charismatic. Choose between the snail, peacock, and bird motif… or better yet, combine all three. The pure white glaze on these plates gives them sophistication and offers a beautiful backdrop for whatever food you’re enjoying. The simple decoration around the edge, as well as the animal in the center, have a playful and dynamic feel. But my favorite part? How light these plates are. They have a weightless feel that reminds me of the antique china my family used on special occasions when I was young. The Spanish dishes at Emilia Ceramics definitely have that antique, heirloom quality to it. These are dinner and dessert plates that you’ll be passing down for generations to come. And isn’t that the true test of winning dinnerware? I am often asked which pieces in the Emilia Ceramics collection are my favorites. The truth is I really don’t have favorites. They’re like my babies, I love them all! I have personally selected each piece in the collection and I know the artists who crafted them personally… how could I possibly play favorites?! That said, there are a few pieces that I favor, especially when it comes to picking out a thoughtful gift: (1) A set of hand painted Italian mugs — And (2) an Italian pottery spoon rest. A colorful, hand painted spoon rest or Italian coffee mug will add instant personality to any kitchen, regardless of its decor style. And it doesn’t matter how many other spoon rests or mugs the gift recipient already has… There’s always room for a new favorite! And believe me, one of these Italian pottery spoon rests or Italian hand painted mugs will definitely become their new favorite. The Tuscan Fruit design is the most classic Italian pattern in the Emilia Ceramics collection. Our Tuscan Fruit Collection includes vases, planters, spaghetti canisters, utensil holders, and serving platters, but some of my favorites are the small pieces, especially the spoon rests and hand painted Italian mugs. They make fantastic gifts for Italian pottery lovers because the colorful pattern is sure to match any other Italian pieces already in the kitchen. I especially love the look of the Tuscan Fruit Spoon Rest on a dark granite counter top! My personal favorite Italian pottery spoon rest and hand painted Italian mugs are those in the Cherry design. I love the bright, refreshing pop of color on these pieces. They have a vibrancy that’s tempered by their rustic, old-fashioned look. Maybe it’s the combination of rich orange-red, steal blue, and lime green, simply painted over pure white… They’re classic, yet cool and very distinct. Anyone who favors blue and white in their kitchen will be thrilled to add a Cherry Spoon Rest or Cherry Mug. They instantly add a fun Italian pop of color to the kitchen. Lemons are probably the most popular fruit in classic Italian designs. They show up in various styles on Italian pottery, ranging from bold and outspoken, like on these Blu Limoni Platters, to more subtle and realistic, like on these … I love the Lemon Spoon Rest by Ceramiche d’Arte Tuscia because of it’s rustic and understated sophistication. It looks perfect on a white or cream counter top, where the rich brick red glaze can really pop. The beautifully-painted lemon offers a fresh, kitchen-friendly look that makes this Italian pottery spoon rest an ideal addition to any home. Ohhh Valentine’s Day… The holiday of love that either makes you excited or just plain annoyed. Valentine’s Day is a romantic, sweet holiday designed to show the people you love how much you care about them. And while this is a great gesture, let’s be realistic: It can be stressful! If you’re married or in a committed relationship, you may have a jump start on what your loved one would enjoy for this holiday. Flowers, chocolates, a romantic fancy dinner, or maybe a fantastic bottle of wine? While you’re contemplating your plans, let us help with some meaningful, thoughtful Valentine’s gift ideas that will be sure to please any and all loved ones in your life. A vase filled with stunning flowers is a beautiful, meaningful gift that will be sure to please. Whether for your special someone, best friend, or parent – there really isn’t anyone who won’t enjoy a beautiful vase of flowers. And while flowers can feel a bit cliche for Valentine’s Day, a gorgeous vase won’t! Pair a stunning ceramic vase with a flower arrangement and your loved one will have a gift they can enjoy for months to come. Bright florals including pink, yellow, red, and white really make a statement in a ceramic vase. Thankfully, Emilia Ceramics has vases in various colors and designs – so you’re sure to find something you love! Check out some of my personal favorites below. Chocolate is another go-to gift for Valentine’s Day. While giving chocolate can feel very cliche, the truth is, everyone loves chocolate! So why not forget the heart-shaped box and instead, give someone you love some delicious chocolate (or any other sweet) beautifully displayed on a fabulous, handcrafted dessert plate. Handmade by our exclusive artists, simple dark chocolate becomes a generous, thoughtful gift when it’s placed on a decorative and meaningful dessert plate… Making it the perfect gift for friends and family! How are you celebrating Valentine’s Day this year? Any creative gift ideas you’d like to share? When I started Emilia Ceramics (eight years ago!) my motivation was to discover amazing artists handcrafting beautiful work. While that goal is still important to me, I’ve also developed a strong attachment to the handmade ceramic artwork itself. I love to find original pieces that are useful, but also have a rich story to tell. That’s why each piece in the Emilia Ceramics collection is handmade and hand-painted by an individual artist with his/her personal influences and motivation. The added benefit of the piece’s handmade origins is that it carries with it a rich tradition of the culture and history from which it comes. The origin of each piece says a lot about it: Ceramic techniques differ from one country to another, as do the mindsets of the artists making them. They craft their work with specific cultural uses in mind and they approach the business of making and selling ceramics in unique ways. I sell a number of products that are very specific to the cultural traditions that have inspired them (whether or not they’re actually used in the way intended). The most popular of these are ceramic jars (whether called urns, ginger jars, or canisters), made up of pieces from Italy, Spain, France, and Mexico. Our Italian jars are probably the closest to resembling their true “ginger jar” functionality, i.e. using these jars to keep spices and other ingredients. However, the Italian canisters are also the most colorful and detailed in their glazing, making them seem more likely to be used as beautiful decorations for the kitchen than actual spice holders. From the Spanish artists at Ceramica Valenciana, we have a few unique canisters that really speak to their cultural origins. The “Ajos” Canister (for keeping garlic) is 5.75″ wide x 8.5″ tall. That is A LOT of garlic! Only Spanish people (and maybe Italians) use that much garlic. Another canister by Ceramica Valenciana that I love is the Garbanzos Canister. Of course you don’t have to use this canister for garbanzo beans, but it’s fun to imagine that at some point in Spanish history a jar filled with garbanzos was quite normal and/or needed. The most popular ginger jars in our collection are made in Mexico. On the Emilia Ceramics website we call these tibores because that’s what they’re called in Mexico. People ask me all the time what these are used for. I really don’t know if Mexicans ever really used them for anything. (If you do know about a use, please let me know!) As far as I can tell, their size, shape, and festive glazes make them perfect for decorating the home and patio. They have been adapted to make beautiful lamps, but a tibor on its own makes a great statement in any style of home. As I’ve worked to discover the most talented artists in Italy, France, Spain, and Mexico, I’ve encountered a variety of personalities and had to vary my business expectations constantly. The challenges of working with artists from such different backgrounds can be frustrating, but they are also a part of the job that I love and would never want to avoid. They demonstrate the humanity behind each work of art in the Emilia Ceramics collection. Not only are our products handmade, they’re also crafted and brought to life by real people who all have different values, goals, and artistic ways of life. Whether you’ve just started dating someone special, been together a few years, or have been married half your life, picking an original, thoughtful gift can be tough! It’s enough to make you want to forget the whole thing. But don’t despair… I’ve got a few ideas that’ll make a big statement, at a variety of price points. Hopefully, you’ll find just the thing to wow your special someone. Looking to splurge on a statement piece that shows just how much you love her? A classic Italian footed platter is a unique gift that will be sure to surprise and impress! A footed platter looks gorgeous filled with fruit or as a sophisticated centerpiece on the dining room table. Every time she looks at this handcrafted work of art, she’ll think of you and feel loved. Handmade by Ceramiche Bartoloni and Ceramiche d’Arte Tuscia in Tuscany, starting at $145. Above: Foglia e Frutta Footed Platter by Ceramiche Bartoloni, $145. Above: Pomegranate Footed Platter by Ceramiche d’Arte Tuscia, $185. Above: Tuscan Fruit Footed Platter by Ceramiche d’Arte Tuscia, $185. Starting at just $48, these vases are bold, colorful, and totally unique to the Emilia Ceramics collection. The small round vase doubles as a makeup brush holder, the medium size vase looks amazing with tulips, and the largest makes a statement on its own and filled with long-stem roses or sunflowers. Your only decision is color — Is her style cheerful, bright, and sunny? If so, opt for the yellow or burnt orange vases. Is she more of a traditionalist? Go with blue and white. And if she’s more contemporary, then a black and white vase is an easy choice. You really can’t go wrong with these Mexican vases, handmade by Talavera Vazques. Above: Cherry Red & White Mugs by Gorky Gonzalez, $20 each. Above: Cherry Mug by Ceramiche d’Arte Tuscia, $48 each. Above: Blue Striped Mug by Talavera Vazquez, $34 each. Above: Polka-dot Mugs by Richard Esteban, $90 for the pair. Also available individually. Above: This is the perfect oval dish for chips and salsa, guacamole, or any other dip. La Azteca Oval Dish and Matching Dip Bowl by Gorky Gonzalez, $84 for the set. Above: This richly-glazed French platter will elevate any cheese spread. Medium Cheese Plate in Barn Red by Richard Esteban, $145. Above: The Pomegranate Oval Serving Platter (or any other Italian platter for that matter) dresses up any meal, making even sausage look sophisticated! By Ceramiche d’Arte Tuscia, $165. These unique pieces will surely bring a smile to his face… and remind him of your love whenever he’s using them. Above: The Tequila Shot Set by Gorky Gonzalez ($58) might encourage a little too much tequila-drinking, but at least it’s beautifully handmade and painted, exuding tons of Mexican charm! Above: The simplicity of these Spanish Cups by Ceramica Valenciana is what makes them so stylish. $46 for the set, also available individually. Above: Does he love salsa? For the guy who can never have enough salsa, these bowls are sure to be a big hit! Pair of Salsa Bowls by Ceramica Valenciana, $56 (also available individually). Above: Whether he’s a lover of everything Italian or he’s always dreamed of drawing his sword on horseback, this beautifully-painted, one-of-a-kind piece will show him how much you love and appreciate his colorful sense of humor. Harlequin Tile with Horseman by Ceramiche d’Arte Tuscia, $285. Christmas is quickly approaching! While we are running around trying to buy the perfect gifts for everyone we care about, let’s not forget the most important, caring, and loving people in our lives: our moms! Read on to see thoughtful gift ideas for our one-of-a-kind mothers and mothers-in-laws. A hand-painted Tuscan vase is an easy, yet super generous gift for either your mom or mother-in-law. This classic piece will add rich, colorful colors to any home… and you can be sure she’ll think of you every time she looks at it. Beautiful whether filled with flowers or on its own. Guaranteed to put you in good graces with mom! Handmade by Ceramiche d’Arte Tuscia in Tuscany, $165. If your mom is a tea drinker, we have the perfect gift set for you. Nothing will make her happier on Christmas morning than opening a fabulous tea pot paired with beautiful tea cups! Starting at $32. Featured Above: Terracotta Cup & Saucer $32. Featured Above: Gorky Gonzalez’s El Verano Tea Pot $98. Featured Above: Ceramica Valenciana Tea Pot $75. These stunning mini bowls by French artist Sylvie Durez are truly one of a kind. With their unique detail and designs, your mom will get compliments for years to come. Perfect for serving dip or nuts when entertaining or used to keep special jewelry in the bedroom or bathroom. Your mom or mother-in-law is sure to cherish her charming little bowl and think of you often! Starting at $46. Featured Above: Bird Among Pink Blossoms Mini Bowl. Featured Above: Thoughtful Mini Bowl. Featured Above: Kitten Pals Small Bowl. Featured Above: Mouse Feast Small Bowl. Is there a certain kitchen decor piece your mom is always wanting, but not apt to buy for herself? Why not help out, with a fabulous canister to place on the kitchen counter. Whether you’re looking for something she will use all the time or just for a fun flair to add to the kitchen, our canisters will be sure to please! Starting at $65, there’s a style to fit every woman’s kitchen. Featured Above: Tuscan Fruit Spaghetti Canister. … And coming up next, Gift Ideas for Your Special Someone. Stay tuned! It’s turkey time! While you’re enjoying a delicious Thanksgiving dinner with friends and family, take a few moments to brainstorm what you’ll be buying them for Christmas or Hanukkah this year. Here to help is this week’s gift guide: Fabulous Gift Ideas for Under $100. A stunning pitcher is guaranteed to add easy design and functionality to a loved one’s kitchen and home. Our variety of pitcher styles allows you to choose the perfect pitcher to add to your friend or mother’s extensive pitcher collection. Great for serving water, wine, milk, and olive oil… or filling with fresh flowers! Handmade by select artists in Italy, Spain, and Mexico. Starting at $56. Is there a gardener on your gift list? You’ve come to the right place. There may be snow on the ground now, but spring is just around the corner. Give them the perfect gift for the blooming season with any of our colorful, fun planters. Handmade by Talavera Vazquez in Mexico. Starting at $58. An easy, yet thoughtful gift, these stunning soap dishes add a touch of Italian sunshine to any bathroom or kitchen counter. Handmade by Ceramiche Bartoloni in Italy. Starting at $42. A stunning set of plates will be cherished for years to come and individual plates can be gifted over time to make up the set. These charger plates are the perfect gift for the person who likes sophisticated elegance – available in red, blue, orange, and green! Starting at $38. And for those who are looking for a softer, more rustic look, our French dinner plates by Richard Esteban are sure to please. The endearing designs will add functionality and charm to your loved one’s home. Starting at $48. Have a hard-to-please friend or family member on your list? Don’t worry, we’ve got more gift guides coming in the next few weeks… Stay tuned! Well, it’s officially holiday season. We are quickly approaching December and that means holiday shopping, parties, delicious meals, time off from school and work, and spending time with loved ones. While it may not even be Thanksgiving yet, many of you are already brainstorming gift ideas for friends, coworkers, and loved ones. So over the next few weeks, I’ll be giving you gift ideas at different price points and tailored toward everyone on your list, starting with today’s theme: Gifts for Under $50. A great gift to give your mom, sister, or best friend! With many different color schemes and designs to choose from, you’re sure to find the perfect match. Hand-painted exclusively by Talavera Vazquez in Mexico. Starting at $24. Our round vases are the perfect gift for any home. Available in various colors, they can be placed anywhere in the home (think kitchen, bedside table, office, or bathroom), look great alone or with a small floral bouquet, and compliment any style of home decor. Handmade by Talavera Vazquez in Mexico. Starting at $48. Whether it’s a pair of bright green mugs or a festive serving platter, colorful Gogo Pottery is a gift that will be enjoyed for years to come. Handmade by artist Gorky Gonzalez in Mexico. Starting at $20. Our newest additions to this collection are these charming GoGo Square Plates (below). Perfect for holding appetizers, small entrees, and desserts, they’ll be cherished far beyond the holiday season. Some of our most popular pieces year-round at Emilia Ceramics are our french polka dot dishes! The bowls come in 3 sizes: cereal ($34), ice-cream ($32), and dip ($30). I love giving a trio of dip bowls, or a pair of ice-cream bowls. Our polka dot mugs are equally charming. They make an easy gift for coffee-loving friends or family. Handmade by Richard Esteban in France. It’s almost that time of year… when family and friends gather together, prepare delicious food, and sit down together to give thanks for all their blessings. I am the first to admit that serving dishes and colorful plates are not the most important part of this holiday. However, I also believe that food actually tastes better when it is displayed well and that hand-crafted pottery is the perfect pairing for hand-crafted recipes. With that in mind, I’ve put together a guide to setting a beautiful Thanksgiving table. The first consideration in how to set a beautiful Thanksgiving table is the size and shape of your plates and bowls. You want to choose ceramic serving platters that fit your food comfortably, with plenty of space for hands to pass the dish or serving spoons to rest within it. #2 Color: Choose a dish that shows off your food. I love adding grapes and dried fruit to a cheese plate, both for the visual effect (adding color) and to balance the richness of cheese. The Rectangular Serving Platter with Tuscan Fruits (below) is perfect because of its hand-painted fruit motif, which supplements whatever you serve on it by adding a backdrop of fresh fruit color. Colorful foods are always the easiest to make look good. The most important thing to keep in mind with especially bright and colorful food is to serve it on a plate or in a bowl that allows its color to really stand out. If the serving dish is too colorful itself (whether in a different or similar color), the food will not stand out. For bright orange yams, I opt for a white background so the color can really pop. Here are too great options (shown below): Ceramica Valenciana’s Rectangular Platter in white and Ceramiche Bartoloni’s Rooster Bowl with Handles. The latter has always been one of my favorite ceramic serving bowls because even when the center design is covered by food, there’s an equally beautiful decoration around the edge that is always visible. In this case, the hints of golden glaze are a perfect complement to the golden yams. Yum! With the holidays and entertaining season just around the corner, now is the time to make sure you’re ready! Here’s a quick rundown of how to get party-ready, from colorful dishware and great serving platters for entertaining, to setting up your bar and making sure you create the right ambiance. Follow this guide now, before the craziness of the holiday season really sets in! Since one of the key elements of entertaining is presentation, it’s a good idea to pull out your plates, bowls, serving platters, glasses, and utensils in advance and inspect for missing pieces or chips. Get a jump start by considering how many people you will be likely to have over, what you will serve, and what the theme will be. Do you have all the pieces you will need? Versatility, function, and design are all key to making sure your presentation will be both eye-pleasing and get the job done. It’s no surprise that serving dishes are some of the most important pieces in entertaining. But did you know that they have played a vital role in the home since the 16th century Roman Empire. In fact, the oldest known serving tray is thought to have been made out of natural materials in the 7th century BC. It was an object of function (versus fashion) and was used to more efficiently carry basins and tea pots. This changed in the 1600’s when the serving tray was usually made out of silver and known as a “salver.” Those lucky enough to have silver serving trays were considered to be among the elite of the population. Keeping the rich history of serving dishes in mind, take a look at your current collection of serving platters and serving bowls. Do you need to incorporate any new shapes or sizes for the entertaining season to come? Make sure to think about appetizers, entrees, and desserts. Think of adding new pieces that will bring design, versatility, and sophistication. And remember, color is key! Above: I love the surprising shape of square and rectangular serving platters. Above: Long serving platters are perfect for appetizers! Above: Nothing says party like polka-dots! This serving dish is both functional and fun. It’s great for serving appetizers and small entrees, and looks fabulous with all food. Above: Large round serving platters are classic and perfect for passing an entree dish. Above: Combining an authentic French look with a festive green glaze, this cheese plate makes a striking statement. If you’re having people over during the entertaining season, chances are drinks are involved. You’ll want to have a fun, stylish place to keep your booze collection and bar tools. Whether it’s a fancy dinner or casual gathering, having a bar setup is a must. Try a bar cart tucked into your bar area or set a tray on top of a credenza or table. And for those who aren’t into booze, try a coffee or tea bar as well. Another way to make your bar more welcoming is to add a touch of handmade ceramics. Think about incorporating a striped or zigzag wine bottle holder (to keep white wine chilled on the table) or a Spanish vino pitcher. When you’re throwing a party, originality is key. For an unexpected twist, try serving wine in vino cups instead of traditional wine glasses. They’re less apt to be tipped over and their handmade quality will have a lasting impression on your guests. This may seem like an obvious consideration but a wonderful evening of entertaining will be strongly enhanced by having lighting that will flow nicely with your theme – You don’t want anything too bright or too dark. Try dimmer switches or low watt lightbulbs to create a lovely effect. And make sure to incorporate the correct music and home decor as well – Candles and a floral vase will give the room a nice ambiance and a mellow soundtrack will be sure to not get in the way during dinner or drinks. How will you update your home for the entertaining season this year? 1. Create a floral arrangement. Our Italian rooster pitcher by Ceramiche Bartolini is the perfect piece to create a stunning floral arrangement. Use bright, warm colors to really accentuate the design. The white glaze backdrop and colorful designs of the pitcher will really make your flowers pop! 2. Create a gorgeous centerpiece. An Italian pitcher vase can do so much, whether it’s being used to serve drinks or not. The beautifully-glazed patterns and colors are striking on their own, so just place one in the center of your table and your set! Our curly-cue blue leaf pitcher is perfect as a centerpiece. Whether you choose to fill it with water, iced tea, or a bouquet of flowers. Either way, you’re guaranteed to have a colorful, bright piece that will make your table inviting. 3. Dress up your kitchen counters and shelves. Tuscan vases and pitchers can really dress up your kitchen decor. Part of their beauty is in their simplicity – Just place one on your kitchen counter or on a shelf to add a warm, rustic, inviting feel. Our Tuscan Fruit Vase is a perfect example, with it’s rich, luscious colors you’ll instantly enhance your home decor! Our Lemon Olive Oil Pitcher and Tuscan Fruit Olive Oil Pitcher by Italian artist Ceramiche d’Arte Tuscia are the perfect pairings for the Tuscan Fruit Vase! Olive oil is essential in the kitchen and occasionally on the table as well. These small but functional Tuscan vases will add a touch of authentic Italian charm to your kitchen accessories. 4. Bring warmth to your bedroom. While Italian vases seem right at home in any room, they can do so much to add sophistication to the bedroom. Growing up, I loved when my mom would arrange a beautiful bouquet of flowers in a vase on my bedside dresser. It is a home decor ritual I continue today. An Italian vase is so feminine and gentle, and looks so stylish next to picture frames and candles. Another trick for using an Italian vase in your bedroom is to place it under a windowsill – The contrast between the curves of the hand-crafted Tuscan vase and the straight edges of a window creates a beautiful juxtaposition. And the incoming light is like a natural spotlight. In one easy step you have a stunning home decor arrangement in the beauty of your bedroom. Do you love Tuscan vases or pitcher vases? How do you use them in your home? Please leave a comment below to let us know. El Día de los Muertos or Day of the Dead is just around the corner (it’s November 1st and 2nd, corresponding with the Catholic All Saints’ and All Souls’ Days). While Day of the Dead traditions originated in the Central and South Aztec Regions of Mexico it is now celebrated in cultures around the world. The holiday is a time when people celebrate and pray for friends and family members who have passed away, aiming to help support their spiritual journey in the afterlife. On the first day of the holiday, people visit their relatives’ graves, decorating them with flowers and candles. It’s a sort of picnic in the cemetery, with friends and family sharing stories about their loved ones buried there. It’s a celebration of the dead, as well as a celebration of the community those loved ones helped to create. These graveside picnics usually feature food that was enjoyed by the loved ones being celebrated. Popular Day of the Dead cuisine includes tamales and pan de muerto, a special bread. Bakers hide a toy skeleton inside (usually plastic) and it’s good luck if you bite into it. Sweets are another important Day of the Dead tradition, with cookies, chocolate and sugar skulls. By biting into the skull shapes, people symbolically “take a bite of death” and rid themselves of the fear of death. Another important aspect of the Day of the Dead are the intricate altars constructed and dedicated to deceased relatives. These are often decorated with yellow and orange marigolds and/or chrysanthemums (yellow is the Aztec color for autumn as it’s the season when nature begins to die). There are both home and public altars, where people leave offerings of their relatives’ favorite foods, photographs, and religious amulets. The altars show the cycle of life and death as part of the human experience. Day of the Dead celebrations also can include parades, music, or dancing; but the main idea is to celebrate life and death together. One of the most popular Day of the Dead personalities is Catrina, the skeleton figure of an upper class female in colorful dress. Catrina gained her iconic status soon after the Mexican Revolution in the 1920s and remains a popular subject in paintings and sculptures to this day. Her male counterpart is called Catrin. He often shows up playing in a Mariachi Band or alongside Catrina. On my last buying trip to Mexico I picked out a handful of Gorky Gonzalez pottery with beautifully-painted Catrina and Catrin images. While some people who are unfamiliar with the joyous-element of Day of the Dead might think this holiday or its skeleton decorations are creepy, many of us find them to be fun, colorful, and full of authentic Mexican charm. The Day of the Dead plates by Gorky Gonzalez are not meant to be used and enjoyed solely during the holiday. Instead, they offer a relaxed, whimsical look at traditional Mexican culture that should be celebrated year-round. I love this eccentric Mexican pottery and I hope you do to! What are your thoughts on this colorful holiday and the traditions that go along with it? Do you know of other Mexican ceramics that celebrates the Day of the Dead? If you know me at all, you know I am a huge pinterest lover. So this week, as the weather began to change and I started thinking about fall/winter home decor, I turned to pinterest for inspiration. So far, I’ve discovered a few great new boards: Kitchens, by Cozy Little House, Dining Room Inspiration, and Display, both by Velvet and Linen. At the moment, I seem to be especially drawn to pins depicting beautifully-crafted French pottery. The delicate and pure feel of French pottery makes a subtle, yet strong statement… and the best French pottery has the power to make you feel like you’re in Paris! The polka dot dishes by Richard Esteban are a great example of this. They have a lightness and rustic quality that is pure French country. Handmade and painted in Southern France, Richard Esteban pottery is emblematic of the rich soil, delicious food and wine, and laid-back lifestyle of Provence. The polka dot mugs are perfect for sipping coffee, tea or hot chocolate as the weather cools. And if you really want to channel the French way of life, there’s nothing like drinking a steaming café au lait from a polka dot French coffee bowl — it will instantly transport you to Provence! Richard Esteban also makes beautiful cheese plates, salad bowls, and dinnerware. His dinner and dessert plates are so simple (with just a few polkadots, stripes, or the basic drawing of a dog, fish, bird, or farm house), but convey so much French country charm. The warm glazes he uses are a perfect fit for the fall! While in a very different style, the French pottery by Sylvie Duriez is another stunning example of unique ceramics from the South of France. Sylvie’s pieces have a hand-crafted purity that is unlike anything else being made. With a few light brushstrokes, she depicts romantic images of fashionable Parisian women, cats and dogs lounging in the countryside of Provence, carefree birds sitting among blossoming trees, and bouquets of wildflowers. Sylvie’s pieces make you feel like you’re standing in a watercolor painting – the delicacy and detail of her work make it a must-have for any French pottery collection. A Sylvie bowl, plate, or pitcher is sure to make your friends “ooh and ahh” …and ask where you found such a stylish work of art! The warm cream and yellow glazes that Sylvie uses for a background on her pieces offer a crisp, clean look that fits perfectly with the pinterest photos I most admired during my recent search. Below are a few other examples of beautiful French pottery and French country decor I discovered on pinterest. I now feel very inspired to update my home decor for the new season. Are there any French design styles you’re looking to incorporate into your fall/winter decor this year? Happy Fall from Emilia Ceramics! I cannot believe it is October already! There’s so much I love about fall – cozy sweaters, rainy days, changing of the leaves, hot chocolate, holiday parties, pumpkin spice, and baking of course! Here at Emilia Ceramics in Boulder, CO, we have many exciting things happening this fall season: We recently imported some amazing new arrivals from Mexico (see a few of my favorites below), plus we have an entire section of the Emilia Ceramics website dedicated to Fall Entertaining Ideas, as well as our usual Holiday Gift Ideas packed with great ceramics to buy for the upcoming season. And with the holiday season quickly approaching, it’s never too early to buy ceramics for all your upcoming parties. Whether for Halloween, Thanksgiving, Day of the Dead, Hanukkah, or Christmas, we have lots of ideas of ceramics to buy for any event. The holidays can be stressful, so get your shopping done early so you can really enjoy them! What are you most looking forward to this fall? Will you be buying ceramics or any other home decor pieces for your upcoming holiday parties? Italian Pasta Bowls for Italian Pasta Lovers! Italians do so many things well: Wine, cured meat, cheese, pizza, cappuccino, gelato. But in my opinion, pasta is their biggest achievement of all. When I visit Italy, I eat a lot of pasta! For those who have had the chance to eat pasta in Italy, you know… it’s just better there! Regardless of its shape or the sauce it’s served with, Italian pasta is (almost always) lighter, fresher, more delicate and flavorful than any attempt to replicate it outside of Italy. But just because we can’t match Italian pasta, doesn’t mean we shouldn’t try. I buy fresh pasta, try my hardest not to overcook it, and dress it with really light, subtle sauces. Another secret to improving the pasta-eating experience is to eat it the way the Italians do. That means mixing noodles and sauce together in the pan so they fully incorporate, then serving large helpings in beautiful Italian pottery. Ceramic pasta bowls really can transport you (mentally and emotionally) to Italy… making the pasta you’re enjoying that much more authentic. Here are my favorite dishes for serving pasta. I can’t promise they’ll make your pasta taste as delicious as in Italy, but they will definitely help. Above: This colorful Oval Serving Platter makes a great backdrop for fresh tomato or pesto sauce. Above: If you’re serving multiple dishes, it’s always fun to include a Footed Platter, like this one with an angel hand-painted in the center. I picture using this one-of-a-kind platter to serve a very simple Spaghetti Aglio e Oglio. Above: The beautiful flowers painted around the edge of this Rooster Bowl with Handles make it lovely to look at even when the rooster is covered… maybe with some delicious ravioli! Above: The Limoni Bowl is just begging to serve a simple fusilli or farfalle pasta salad. It evokes a sunny Italian charm that’s right at home on a back patio. Above: The rooster is one of the most popular motifs used to decorate Italian ceramics. This Large Serving Platter is a charming example of Italian ceramic roosters at their best. It would make an amazing dish to serve a traditional Spaghetti and Meatballs! Above: The Large Frutta Venezia Bowl is Italian Majolica ceramics at its finest. The rich colors and medium depth of this bowl makes it the perfect dish for serving a huge portion of Bucatini all’Amatriciana. A few years back, we decided to add Deruta pottery to our Italian dinnerware collection. My #1 priority was of course finding some sophisticated, functional single-serving pasta bowls for Emilia Ceramics (and myself). I found just that with these bowls made by Gialletti Giulio in Deruta, Italy. We have the more traditional Deruta patterns in matching dinner and salad plates, but I love the subtlety of these stylish bowls. They’ll improve upon even the best Spaghetti alla Carbonara! This week I am excited to talk about one of my all time favorites – black and white vases. The simple, yet stylish color combination is all the rage these days. Whether in fashion, art, interior design, home décor, or weddings, I’m always bound to ooh and ahh over black and white arrangements. One simple and fun way to incorporate black and white design into your home décor is to use black and white vases. The strategic use of black and white vases is a must – you are guaranteed to look fashion-forward and chic, after all black and white goes with just about anything! Pair with your favorite set of flowers and your set. 1. Use a pop of color! One of the beauties of black and white is it’s classic presence, which never goes out of style. You can spice up your home décor in a matter of minutes with the use of a black and white vase! I love to put a black and white vase on a table, mantle, or dresser to give the room flavor and a bit of edge. I especially cannot get enough of this gorgeous hot pink floral paired with a black and white vase mantle setup by Stephanie Sterjovski – Home décor has never looked so stunning. What are some of your favorite ways to use black and white? Tell us in the comments below! When Emily announced in the spring that she was planning a buying trip to Mexico, I knew we would be in for something special. After all, the crafts of Gorky Gonzalez, Capelo, and Talavera Vazquez are nothing less than spectacular. I love how beautifully crafted all their pieces are, and the fantastic functionality. It’s hard to choose favorites, but I wanted to pull together a must-have list just in case you were seeking the perfect gift or to add to your own collection. Even in the throws of summer, I have fall entertaining on my mind. I just love the crisp evening air, the teaser of the holidays around the corner and having friends (who are not traveling or skiing!) in town for once. Fall begs for dinner parties and I’m happy to oblige. This year I am exploring adding Spanish dinnerware to my collection. As such, I need not look any further than the Ceramica Valenciana dinnerware here at Emilia Ceramics. Ceramica Valenciana’s creations are infused with personality and flare, designed following traditional majolica methods; each piece is handmade and hand painted. These daring pieces can brighten up any party, and I love the variety in styles. There is no better way to liven up a gathering than by serving your delicious offerings on fanciful dinnerware. These pieces are unique and full of whimsy, and would even look fantastic as home decor (in fact, lots of folks choose to mount these pieces on their wall). There is no doubt this Spanish dinnerware would be a conversation starter. I have a confession. Most of the time, I am a plain-Jane, keep-it-simple kind of gal. That’s one of the reasons these contemporary pieces really speak to me. The pop of color, the simplistic design, the lovely shapes – these beautiful pieces are subtle, yet sophisticated and would fit in nicely with any other style. Somewhere between Ceramica Valenciana’s super-fanciful dishes and their simple, more contemporary pieces, lay the relaxed charm of their dinner and dessert plates. I love these lightweight, animal-inspired dishes! Will you be adding dinnerware for fall entertaining this year? Do we ever tire of the classic and sophisticated combination of black and white? I think not. And, when it comes to incorporating this contemporary color combination into your home decor, there is nothing more versatile than ginger jars! Let’s explore some black and white ginger jars and how you can add them, no matter what your style. A patio filled with colorful blooms is the perfect place to add a black and white ginger jar. This extra large black and white zigzag tibor is a great example — the chevron pattern adds a modern and stylish look, whether displayed prominently in the living room or on the patio. I love how Made By Girl added this Large Black Ginger Jar to a display of other unique pieces. The simplicity of it all creates a stunning montage of textures and visual interest. What can be more sophisticated than two bold black and white ginger jar lamps in your entry way? The space above was designed by Meredith Beregovski of Georgia Street Design in Charlotte, NC. It’s a stunning representation of how you can decorate with black and white ginger jars. ZigZags are not the only black and white ginger jars we love. Stripes and florals, especially when combined, can also add drama to a space. These ginger jars would be a great addition to a more relaxed, yet modern home. Display them together prominently on the shelf or fill one with a large bouquet of flowers. No matter how you incorporate them, they’re sure to add a whole new layer of style and sophistication to your home! Unusual Utensil Holders: Kitchen Style Gone Wild! What are people using to hold their essential kitchen utensils these days? From coffee cans to a Tuscan utensil holder, the ways to hold those wooden spoons and spatulas are vast and varied. Here are some of my favorites, from wacky to classy: which suits your kitchen style best? Creative reuse is a way to definitely make a statement on the kitchen counter. Tarnished silverware mixes with glass and metal on this unique utensil holder featured on the Kitchen Designs blog. The patina means this is one piece of silver you’ll never need to polish. Slices of old pipe get a new lease on life courtesy of PaulaArt on Etsy with utensil holders like this that are something more than just industrial chic. French and Tuscan country design extends all the way to utensil holders. Fruits are a favorite motif, giving Tuscan utensil holders a charm that’s more than just rustic. Another of my favorites is the blue rooster Tuscan utensil holder – he’s definitely fun from sunup to sundown. Solid and easy to load up, ceramic utensil holders are another consistent favorite. Six of the utensil holders on Jeri’s list are ceramic, in a wide variety of styles. The Tuscan utensil holders by Tuscia d’Arte are a perfect example of this type. I’ve also had customers purchase wine bottle holders to use to corral the kitchen counter. One paired a blue and white striped holder with a blue and white zigzag one for utensil holders with modern flair that can hold everything a cook needs; such an ingenuous idea! You could do the same with a Tuscan vase, just make sure it won’t tip over. Sometimes simplicity is all that’s needed. A friend of mine has collected cookie tins and other cans from countries she’s lived in like Greece and France to create utensil holders (as well as pen holders on her desk) that remind her of her travels. 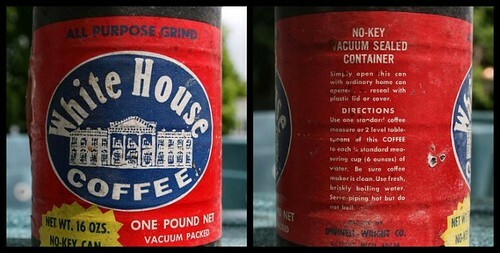 A vintage coffee can like this one below is another unique touch. You can always decorate a can, either with magazine photos in a collage (à la your resident 6 year old) or with this more sophisticated DIY from Better Homes and Gardens that looks like something you’d find at a design store. With everything else becoming more and more streamlined, why not your cooking essentials as well? This set by Geek Alerts has one handle, with many different attachments, designed to take up minimal counter space (though I think it would be hard to cook multiple things at once without multiple handles). Other minimal utensil holders just hold a few items, leaving your counter-top clear for other items. What utensil holder style speaks to you? Modern, DIY, Tuscan utensil holders, vases, or something else? I cannot believe it’s already August! As far as I’m concerned, it’s finally starting to feel like summer. And since I don’t have to go back to school, I figure why not enjoy the warm weather and stretch out the relaxed summer vibe a bit longer! Below I’ve come up with a few ideas for no-fuss summer entertaining (all built around a summer beverage) that feel right at home in August… or September. Summer parties are fun in so many ways (think swimming pools, burgers, warm nights, beautiful sunsets, croquet and corn hole) but one of the best parts is the ice cold beverage in your hand during all those activities. Everybody has their favorite, but these three drinks are crowd-pleasers that don’t require much work. What I like best is that whichever drink you choose, you can then plan an entire party around it. Of course, you might still need to offer some beer and Pinot Grigio (for the less adventurous) but these drinks really do make the party. My favorite margarita is a strong margarita. Here’s a great recipe for a strong pitcher of margaritas that you can make ahead and then serve to your guests upon request. If you’ve chosen the margarita as your party drink, you’ve clearly got a party theme ready to go. Everyone loves a taco bar where they can load theirs just as they like it. Add some chips and guacamole, displayed beautifully on a few Mexican serving platters and your party is complete. Nothing elevates a party like Champagne. But Prosecco (the Italian version) and Cava (the Spanish version) are just as tasty and often less expensive. If this is a fancy Champagne-inspired party, dress up your buffet table as well. One of my favorite tricks is having dishware at various heights, like serving cheese and crackers on a footed platter, that’s arranged stylishly next to square plates and oval dishes. The variation is pleasing to the eye and ensures that all your party snacks stand out. More Ideas: Check out this pinterest photo of a wheelbarrow filled with bubbly! Nothing says summer like an ice-cold Gin and Tonic (with lots of fresh lime). It’s so easy, yet oh so satisfying. Gin and Tonics remind me of my mom (she loves them), which then makes me think of her mom and the type of summer entertaining my grandmother probably did 50 years ago. I think of fun, old-fashioned finger foods, like cucumber sandwiches, deviled eggs, pigs in a blanket, and crab dip. While these might sound slightly more labor intensive, they’re really all prepped in advance, leaving you to enjoy the party, Gin and Tonic in hand! I picture that my grandmother would have loved serving appetizers from this fun Spanish dish: Caracol Serving Platter. Are you planning any more summer soirees? What’s your theme… and your drink of choice? If you need inspiration, check out our ideas for Summer Parties or our Party Planning Pinterest Board. The final visit on my recent trip to Mexico was to the showroom and studio of Talavera Vázquez, located in the small, pottery-centric town of Dolores Hidalgo. Talavera Vázquez is a fourth generation, family-run business focused on marrying Mexican tradition with current day design innovation. While owner Roberto Vázquez was not there the day of our visit, his outgoing son Arnold Eduardo Vázquez Cortez was there, using his nearly perfect English and touring us around. Also helping us were Francisco Frausto Valdez, a 20+ year employee of the Vázquez family, and Maria Elvira Lopez Gonzalez, who is my business contact for orders. Maria and I do so much long distance emailing and talking that it’s always fun to see each other in person. I feel lucky to be able to work with such a friendly, helpful, and creative team! We had the opportunity to watch some of the artists glazing pieces that were destined for the Emilia Ceramics collection. Below, Carlos is painting a Large Hidalgo Vase. Below, painter Paula carefully decorates a Blue ZigZag Tibor. On the right are three recently-painted Paloma Round Vases. Another artist (called the esmaltador) Jose Salvador Godinez demonstrated for us how he bathes each piece in base glaze (esmalte in Spanish). This is the first stage in the glazing process (after the terracotta clay has been fired). I took the two videos below, which show Jose stirring up the glaze to be sure it has consistent thickness and color throughout; And then bathing a ginger jar in the glaze. While he makes this look easy, anyone who has glazed their own pottery knows this is anything but straightforward or foolproof! He must do it at just the right speed and be sure that the entire piece is covered evenly and dries evenly as well. After hand-painting each piece with its respective design, they are loaded into the kiln for a final firing. I love the rustic way these pieces are all packed tightly, yet safely together to maximize kiln space. Besides reconnecting with the Vázquez team and seeing their artistry in action, I love to visit so that I can pick out new and original pieces for the Emilia Ceramics Collection. This time on my visit, we found some great new small objects, like soap dishes, jewelry boxes, and simple vases for holding pens, pencils, and toothbrushes. We also picked out a few large statement pieces, such as beautiful big vases, a large sunflower serving dish, and the lamp pictured here. I can’t wait to share all the new finds on the website… hopefully we’ll have them all available in the next week or two. The new Gorky pieces are already up. While Dolores Hidalgo is known first and foremost for its Talavera Pottery, it is also famous for ice cream. In the town’s main plaza there are at least 6 dueling ice cream stands, competing to sell not only the best tasting ice cream but also the most original flavors. Check out the sign below! I tried the tequila, refused to try the camaron con pulpo (that’s shrimp with octopus!! ), and finally settled on beso de angel, which was some sort of combination of caramel, almonds, and vanilla. Que rico! Learn more about Talavera Vazquez here! Italian pottery spans far too many different styles, shapes, and uses to sum them all up in one blog post. However, this week I am doing a Pinterest round-up of some recently posted favorites, which represent a few of the many ways Italian pottery can be used and enjoyed. Starting with our very own Limoni Oval Platter. A spectacular serving platter or display piece, featuring sunny lemons on a crisp white background. It will brighten any meal or any nook you choose to display it in. Italian ceramics are not just for the table. Mounted on a wall, they add a level of flair and drama. And there is no need for them to match perfectly… the more eclectic your collection, the better! Turquoise and salmon give a pop of color and add incredible energy to a space. I love how they’ve displayed a variety of Italian pottery pieces in the same color for added drama. We love ginger jars here at Emilia Ceramics! I think this oversized version is simply spectacular. It includes the classically designed fruit in intricate details and vivid colors. Italian ceramic tile makes a stunning statement, whether it’s in your kitchen, on your patio, or incorporated into some other nook in your home. I would love a bathroom tiled with these intricate pieces. Italian ceramics are incredibly complex and time-intensive, especially the task of hand-painting, which is a precise skill that allows for no errors. That’s why we have partnered with the best in the business. Learn more about our artisans here. And, shop our collection of Italian ceramics here. Container gardening is a very satisfying way to brighten up your porch or yard, and it’s a great way to get started with gardening. You can fill planters will beautiful flowers, delicious herbs or even try your hand at vegetable gardening. Today, we’re looking at ways to create stunning planters using foliage and flowers. Here are a few tips to get you started. Thinking about a plant’s size and shape will help you figure out what kind of statement you’ll want your planter to make. Plants tend to be either upright, broad or trailing and successful containers usually include a combination of all three. Start with the tallest upright plant and work your way to the trailing. Will your pot be placed in the sun or shade? Do you want it to be on a porch or deck? Think about where the pot will be located and then select plants that will like living there. Labels on plants will usually list their sun/shade requirements. Foliage and color are both important in creating a successful container garden. Once you’ve gathered the plants you’re considering, arrange them based on the size of the leaves and their surface texture, as well as their color combinations. A well-composed container garden can be as important to a space as a piece of furniture – it can create energy and excitement. Just as the structure, location, texture and color are important components of a stunning plant, so are the details of the pot you choose to put it in. You can choose from a variety of finishes such as terra cotta, plastic, wood, or our favorite, ceramic planters! There are festive zigzag planters, contemporary striped planters, and more elaborate hand painted designs. Each ceramic planter will add beauty and richness to the plants you choose to use. We would love to see what you come up with! Feel free to share your creations to our Facebook page.